Kre8 has been in the business since 2012. Our core focus has been in mobile billboards. We have core static boards too, but we were the first in Las Vegas to introduce digital mobile boards. 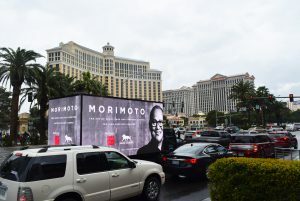 From there, over the last 18-24 months, we’ve taken the next step and launched what we call Iconic mobile billboards. 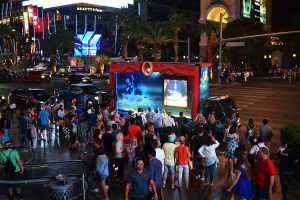 We also have an experiential marketing department launched 3 years ago and, most recently in March, we introduced the “Touchdown Towers”, which are 45 foot tall, high impact units on the Strip. We currently have over 200 employees and I’d like to think we bring a real creative and high-impact media approach to out of home. It’s a challenge for everyone and that’s where the creative approach comes in. Along the tourist corridor in Vegas, including the Strip, there are so many things happening, from the marquees to the mobile boards. We use creativity and our high impact units to stand out. The digital mobile boards are very intimate products that feature the ability to change out creative and reach people at eye level. 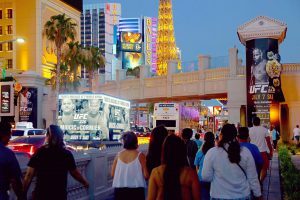 The Iconic boards have made a real splash and we’re getting some great feedback form clients and people walking on the Strip. We started with out first board 2 years ago and now we have over 8 of them on the road. In Vegas or anywhere else, people just aren’t used to seeing a full show on wheels from an LED screen with figures moving back and forth and stage fog. Our clients are looking for the next thing to break through the clutter and these pieces have allowed us to help them to stand out. The biggest change is that we’re no longer just a sign on the street. The creativity in the industry speaks for itself and is really standing out. We are also becoming a lot more personalized, which is extremely important as we’re trying to break the clutter of all the media that’s out there. We’ve seen an increase in the synergy with digital. We’re not just relying on standalone outdoor campaigns but instead integrating with digital, social media and targeting. We’ve seen that OOH can pair up well with other forms of media and we’re continuing to adapt to take advantage of that.